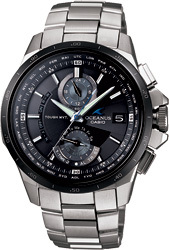 Introducing the latest addition to the OCEANUS lineup of Tough Solar timepieces designed and engineered under a brand concept of “Elegance and Technology”. Sapphire glass with anti-glare coating combines with a titanium case and band with a scratch-resistant titanium carbide coating. Small-size band components are used for look a quality and elegance. This model comes with an innovative Smart Access system that delivers powerful functions and easy operation.